It is my job to seek out cultural experiences and then introduce them to you, the readers. Living in a south London suburb this means, at best, a train ride into the centre or, at worst, a flight. 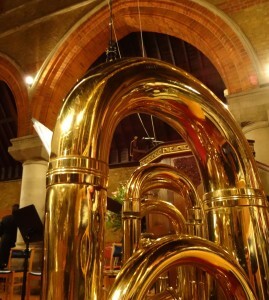 So it came as a pleasant surprise to see an advert for a concert, The Best of British Brass, being held at my local church. The church, St Barnabas in Beckenham, is a rather attractive late 19th century building with very good acoustics and, as it is only a five minute walk from my house, did not involve trains or boats or planes. The concert was performed by a dectet drawn from The Symphonic Brass of London, an ensemble of Britain’s finest brass players. The latter part of the performance would feature an orchestra representing the Bromley Youth Music Trust. The first item was the suite from The Fairy Queen by Henry Purcell. The music originally supported a modernised and condensed version of A Midsummer Night’s Dream, the six segments took us through the various moods of the story. The second piece was the familiar On Hearing the first Cuckoo of Spring by Fredrick Delius, difficult for a brass band but it was played with sensitivity. The piece before the interval was Peter Warlock’s Capriol Suite. Crees has arranged this specifically for brass which gave it a very exuberant feel. Although the venue was a church the atmosphere amongst the packed crowd during the interval had more of a crush bar feel about it. Welcome glasses of red and white wine being available next to the tea and sandwiches. After the break Simon Wills, one of the ensemble, has composed a series of musical sketches based on characters from John Aubrey’s book Brief Lives. We heard light hearted and amusing characterisations throughout the seven parts. The final piece was Joby Talbot’s avant garde piece Pitch Black, edited by Eric Crees who had suggested the addition of some percussion to give it extra colour. This was by far and away the most modern part of the programme. It was then the turn of Ian Rowe to introduce and conduct the Bromley Youth Brass Band. Their first piece was Slaidburn by William Rimmer. This popular march was written by the composer while he was recuperating in the Ribble Valley village of Slaidburn for their Silver Band. Their second piece was that well known hymn, Parry’s Dear Lord and Father of Mankind, made even more moving by the church setting. The final work was a modern piece, The Golden Lady, by Goff Richards. This, like the other two pieces, was conducted with energy by Ian and this in turn gave all of their music a very fresh and upbeat feel. For the finale the ensembles came together for a rousing rendition of The Floral Dance, the enthusiastic clap along by the packed audience an indication of how much everyone had enjoyed the performance. Accessibility to culture and the arts is essential to keep them alive and well. Offering people the opportunity to hear a world class concert in a local setting and with the tickets at £5.00 per person and only £1.00 for the under 16s put this uplifting experience within reach of everyone. Peter Morrell writes for The Cultural Voyager – a website dedicated to people who pursue cultural activity as a major part of their lives. With kind permission, we are delighted to share Peter’s experiences of an evening at St. Barnabas with you.